October is National Bullying Prevention Month and the Anti-Bullying Collaboration (ABC), a Collective Impact Project of The Parent Child Center of Tulsa, is leading the way fostering bully free schools and communities. The statistics are staggering. 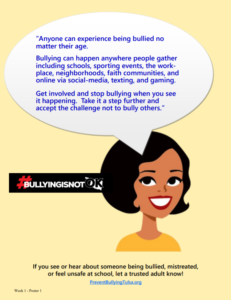 One in five (21.3%) Oklahoma high school youth were bullied at least once while at school last year while another 16.1% were bullied at least once in cyberspace. Over 10,000 (6.1%) Oklahoma high school youth did not attend school because they felt unsafe at school or on their way to or from school. To address the critical issue of school bullying, the ABC developed an extensive Bullying Prevention Month Tool-Kit to assist our schools and community to take bullying head-on. 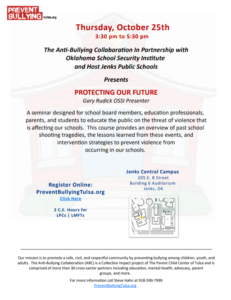 The Tool-Kit features four weeks of lesson plans, a resource guide for educational and therapeutic services, a school-wide “Mellow-Yellow” bullying prevention campaign, Safe School Committee guidelines, and finally registration information about Protecting Our Future – a free seminar provided to the public to learn about school shootings and what law enforcement agencies know (2 C.E. hours for LPCs and LMFTs available). Tulsa’s Channel 8 – KTUL continues to provide excellent PSA messaging bringing awareness to bullying issues across our community and state. Watch for two new Public Service Announcements during October featuring News Anchor Neile Jones guided by ABC bullying prevention concepts! Remember to use #BullyingIsNotOK when posting bullying prevention messages online! 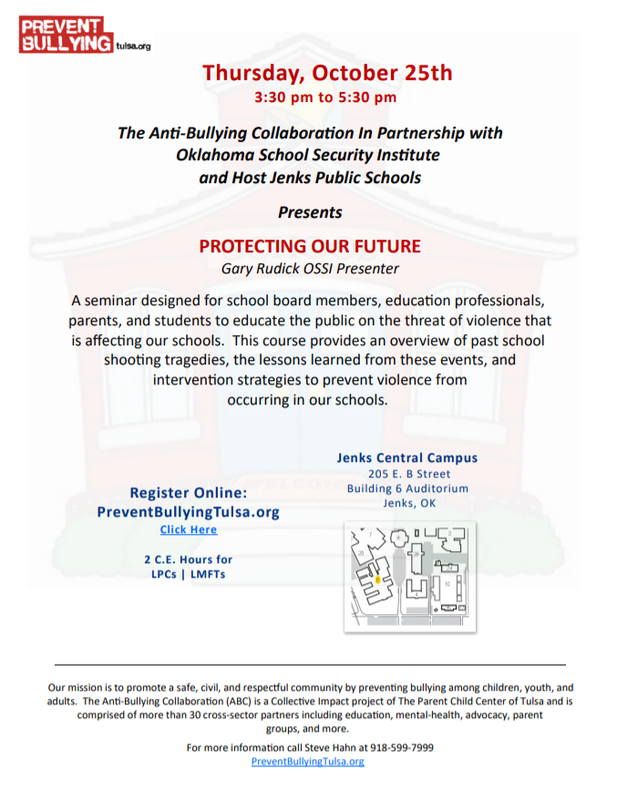 Contact Steve Hahn (ABC Director) to learn more about our Bullying Prevention Tool-Kit, to schedule a training or workshop for your organization or business, or to register for the “Protecting Our Future” seminar to be held on October 25, 2018 from 3:30 – 5:30 p.m. Your ticket for the: October is National Bullying Prevention Month!